This Sealine S28 is inimmaculate condition both inside and out. A stylish and versatile sports cruiser with spacious accommodation and a very social cockpit. The Sealine S28 Sports Cruiser offers all that is needed for comfortable cruising & weekend fun. The superb cockpit seats up to eight adults. The cockpit table also converts the seating area into a double sunbed, while the two-part canopy neatly stows in the radar arch. Attention to safety is a priority: the full-width bathing platform incorporating a concealed swim ladder & hot/cold shower, gives safe, easy access to the cockpit. 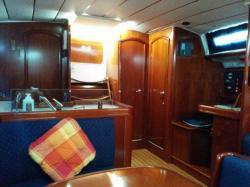 The saloon has large U-shaped seating with a dining table that seats seven and converts into another double berth. The S28 features full accommodation with a total of four berths, with the saloon/cabin conversion having en suite access to the toilet/shower compartment. The galley has a hob & fridge, twin sinks & ample storage. Superb performance is coupled with safe, responsive handling. Disclaimer The particulars detailed herein are intended to give a fair description of the vessel but their accuracy cannot be guaranteed.. The vendor is not selling in the course of a business unless otherwise stated. The prospective purchaser is strongly recommended to check the particulars and, where considered appropriate, at his own expense, to employ qualified agents to carry out structural and/or mechanical and/or electrical surveys and inspections in order to assess the actual condition of the vessel before purchase.